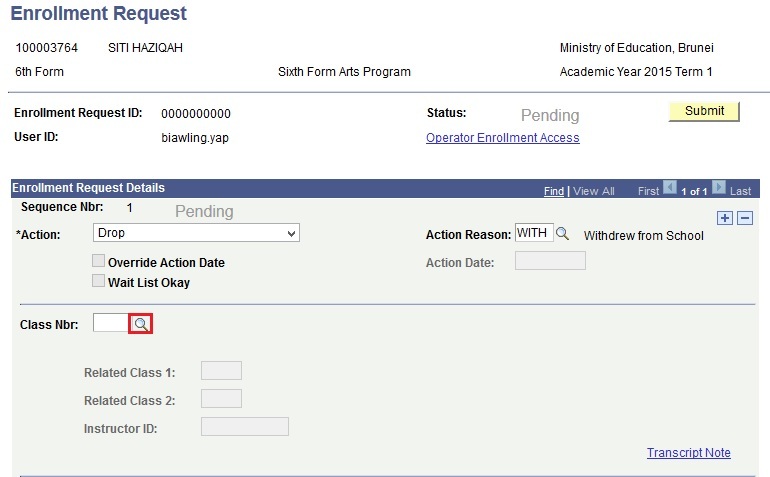 This function allows the users to record the outcome of a completed Student Withdrawal Request form. 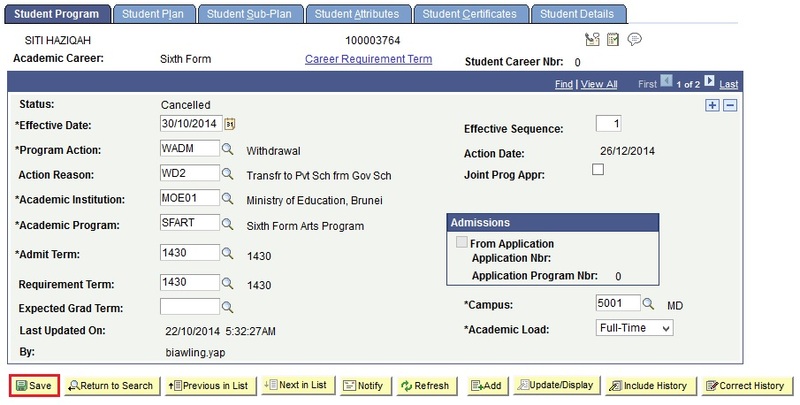 Navigate to Main Menu > Records and Enrolment > Enroll students >Enrollment Request. 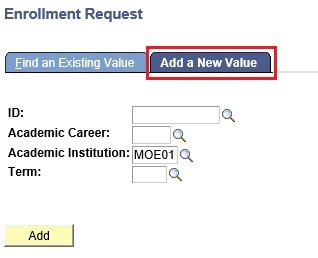 To create a new request, click on the Add a New Value tab. 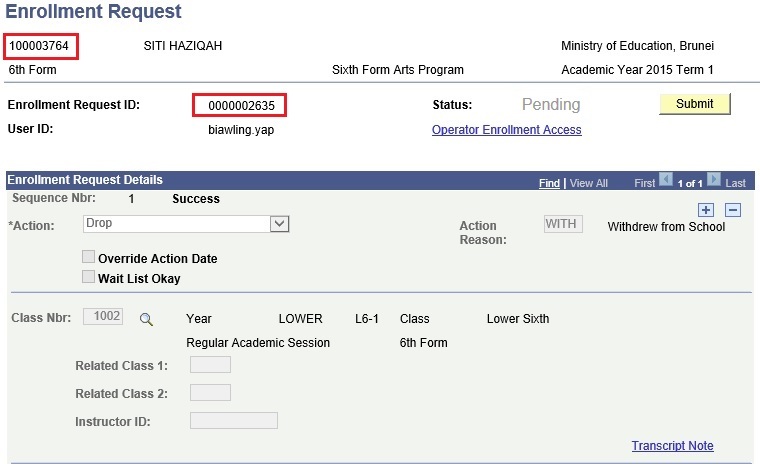 Enter or click on the lookup icon to select the Student ID of the student who is withdrawing from school. 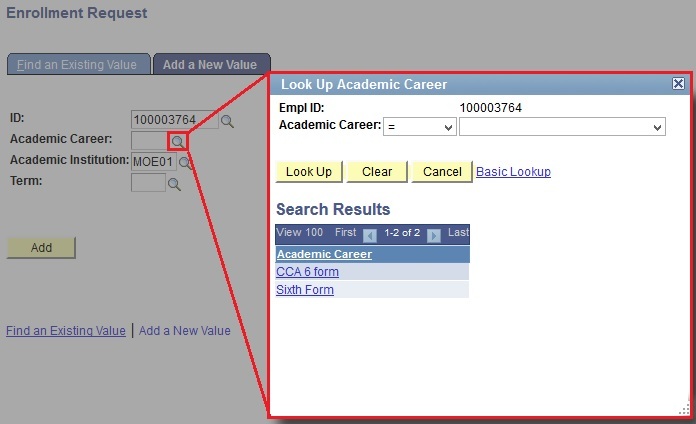 Enter or Click on the lookup icon to select the Academic Career of the student. 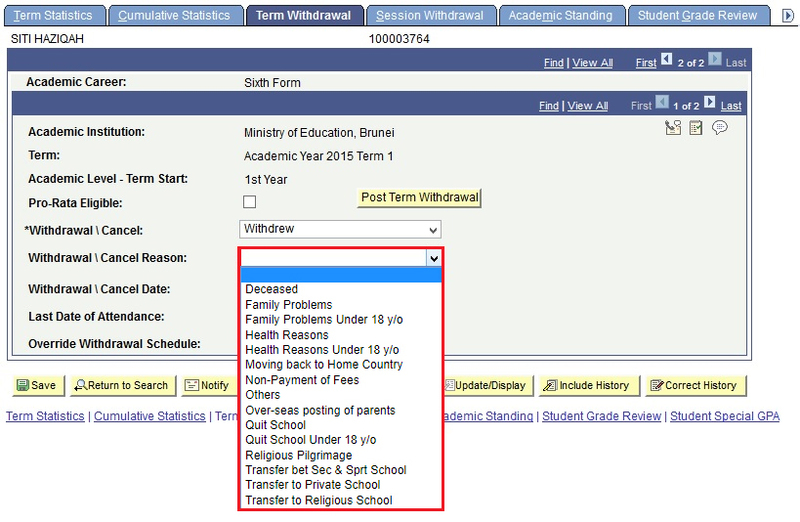 Enter or click on the lookup icon to select the Term in which the student is withdrawing from school. 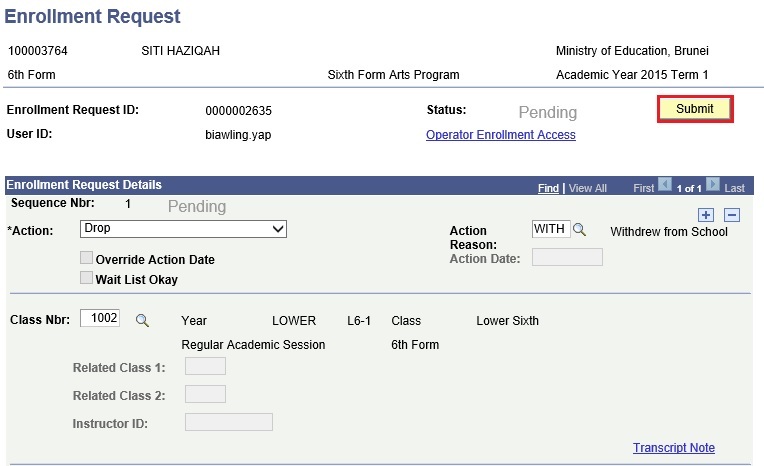 User will be directed to the Enrollment Request page. Select the Drop from the *Action drop down. Click the Action Reason lookup to select the Action Reason. 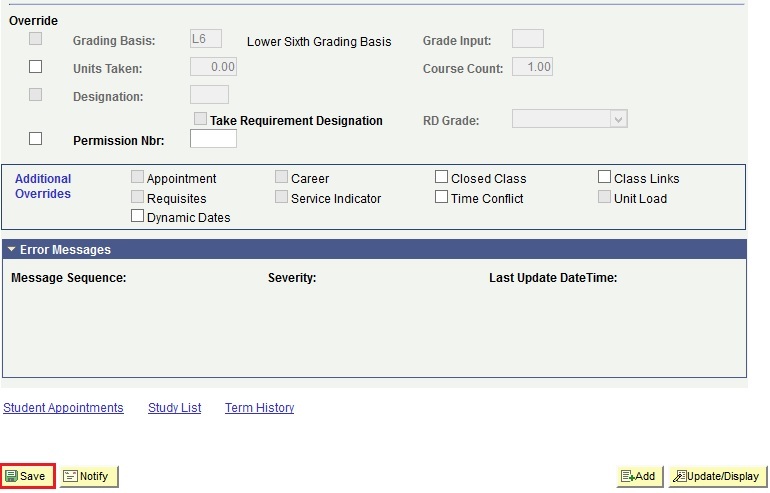 Click on the lookup icon to select the Class Nbr of the classes the student is currently enrolled in. Select one Class the student is enrolled in. Once the first class is selected, to add another class, click on the ‘+’ icon. 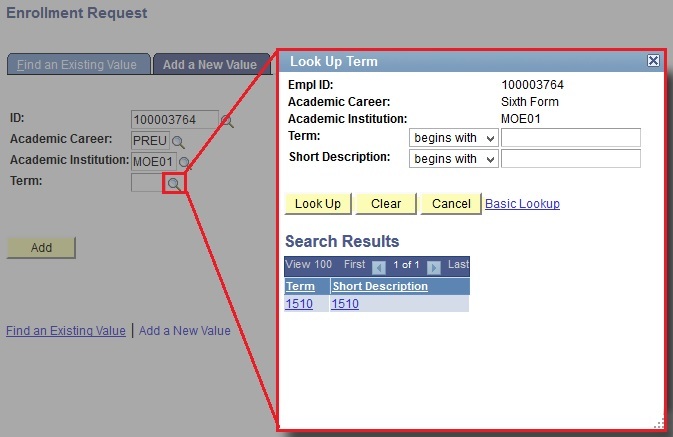 Click on the lookup icon to select the Class Nbr of the next class the student is enrolled in. Repeat steps 12 and 13 until all the classes the student is enrolled in are added to be dropped. Everytime the ‘+’ icon is clicked, a new Sequence Nbr is aincremented with each newly added Class Nbr. Once all the classes are added, scroll to the bottom of the page and click on the Save button. 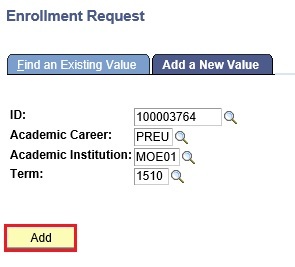 Upon saving the Enrollment Request, an Enrollment Request ID will be assigned. Click on the Submit button to submit the enrollment request. 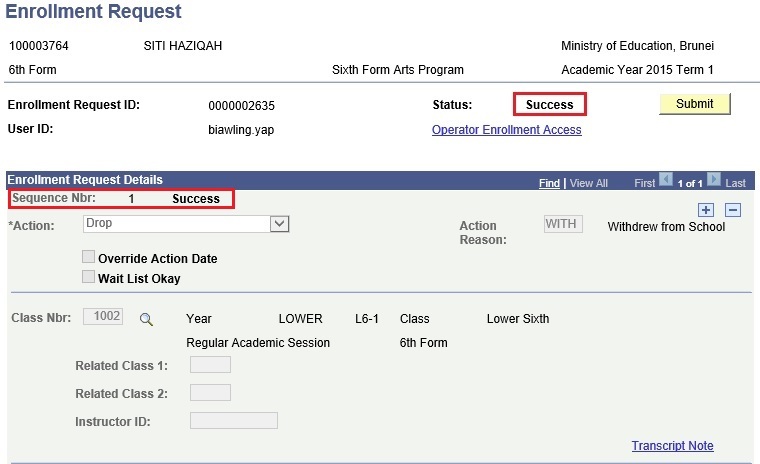 Upon submitting the Enrollment Request, the Status will be updated to ‘Success’. 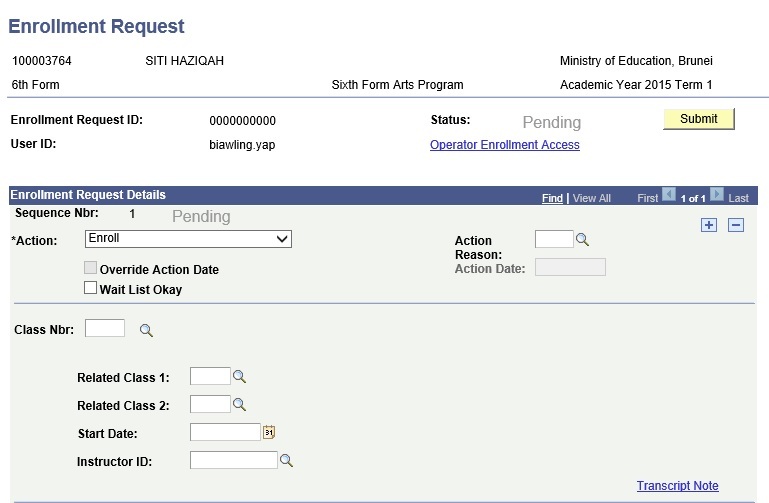 After the dropping of the Enrollment is successfully submitted for the first record, the user should drop also the Student from the CCA Career. 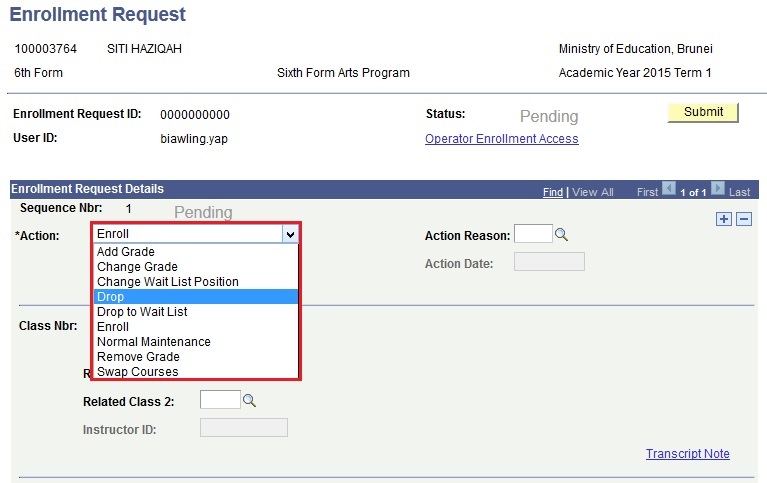 To remove the Student in the Student Block, go to Main Menu > Records and Enrollment > Enroll Students > Block Enrollment > Create Student Block. 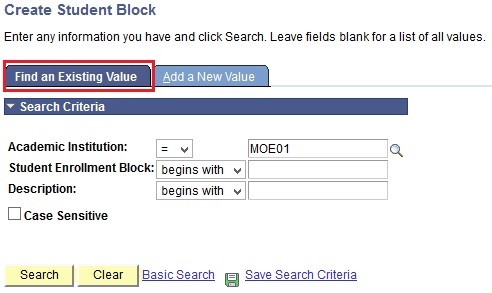 To Find an Existing Student Block, click on the Find an Existing Value tab. 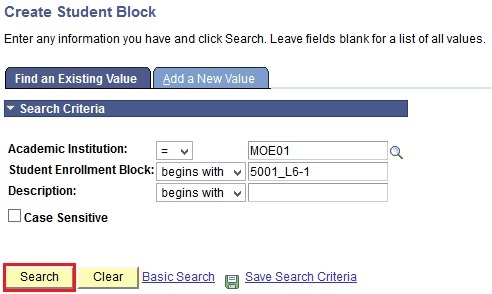 Enter the Student Enrollment Block in the Student Enrollment Block field. User will be directed to the Block Enrollment Student page. Click on the ‘-’ icon to remove the Student in the Student Block. A confirmation message will pop out. 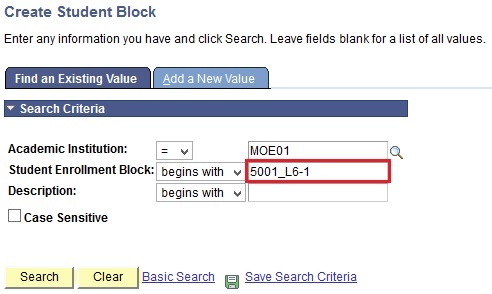 Click on the OK button to proceed in removing the Student in the Block or the Cancel button to return to the Block Enrollment Student page without removing the Student. 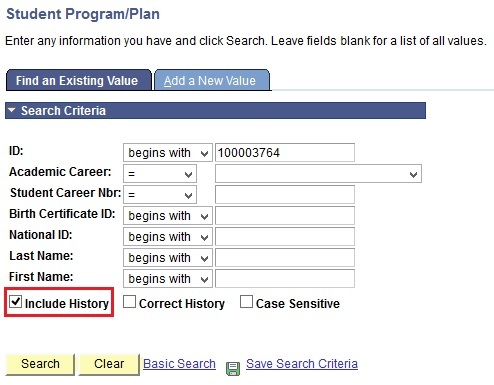 Navigate to Main Menu > Records and Enrollment > Student Term Information > Term History. 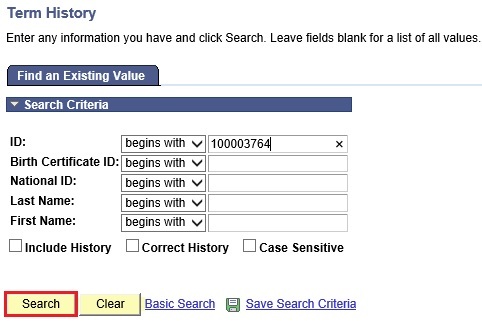 To search for the student’s term record, click on the Find Existing Value tab. Enter the Student ID number. 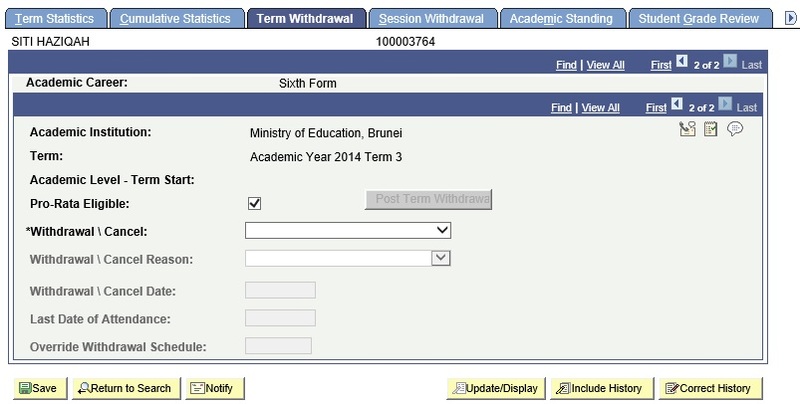 Click on the Term Withdrawal tab to withdraw the student from the term. User will be directed to the Term Withdrawal page. 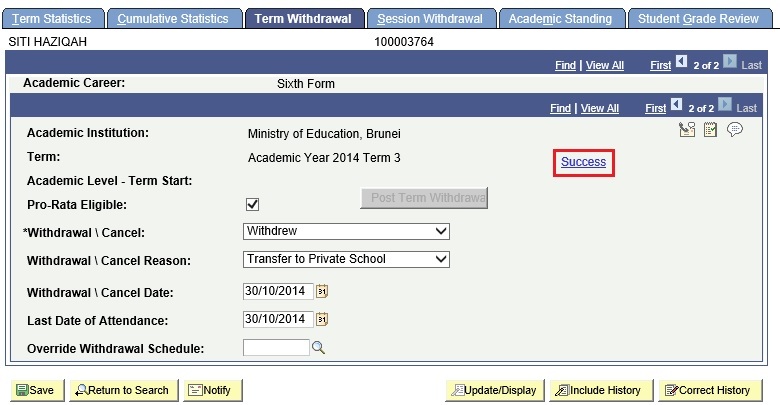 Click on the Withdrawal \ Cancel drop down list to select the option ‘Withdrew’. 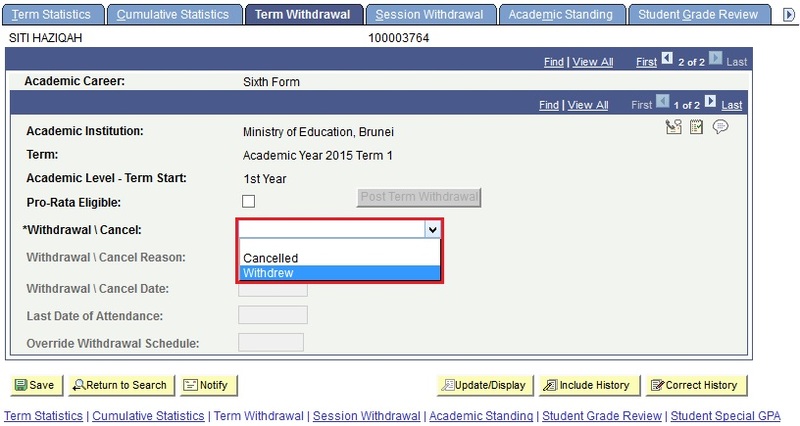 Click on the Withdrawal \ Cancel reason dropdown list to select the reason based on the Withdrawal Request Form. 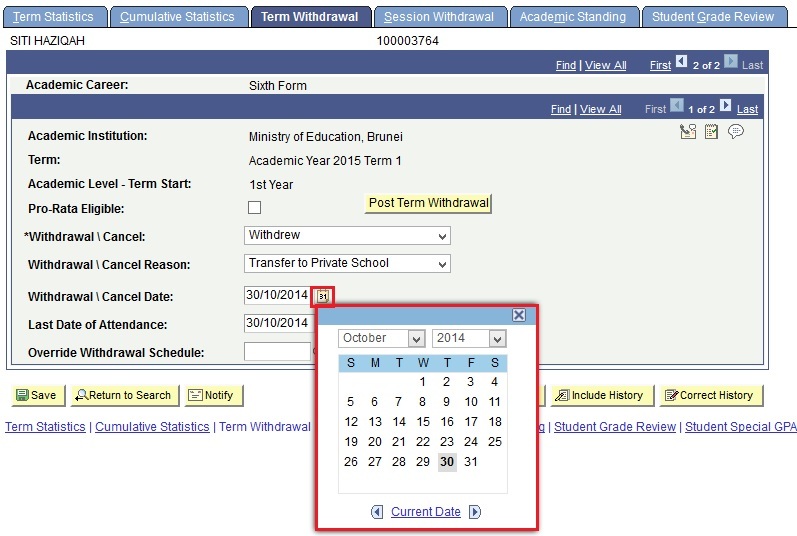 Click on the Calendar icon to select the withdrawal date of the student in Withdrawal \ Cancel Date. 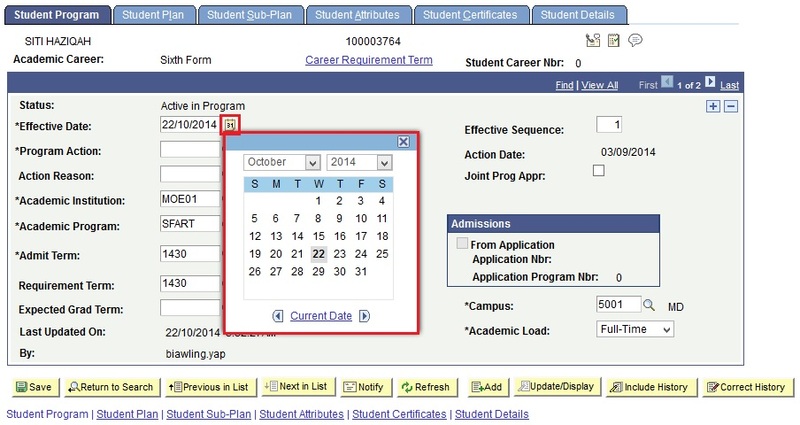 Click on the Calendar icon to select the Last Date of Attendance of the student. 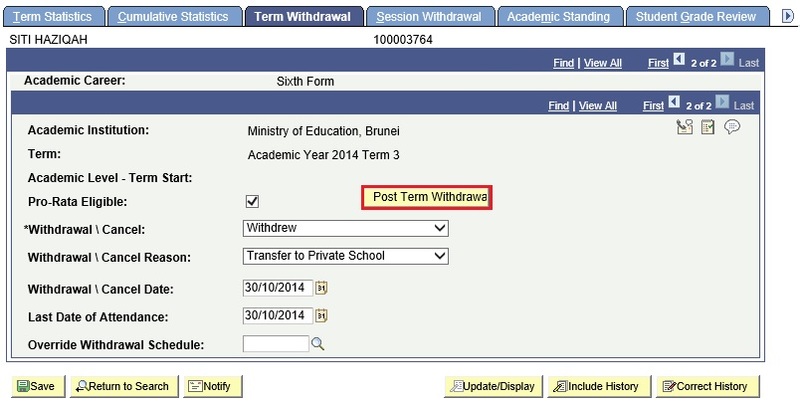 Click on the Post Term Withdrawal button to complete the term withdrawal for the student. Once the term withdrawal is successfully posted, the Status of the Term Withdrawal would be Success. 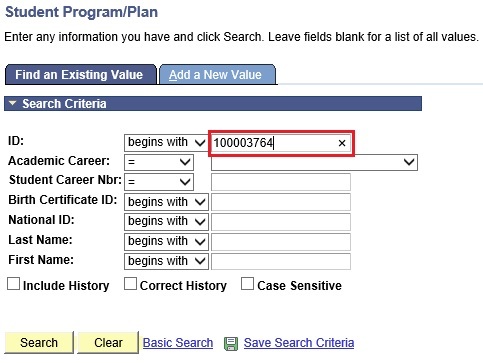 After the Term Withdrawal is successfully posted for the first record, the user should also Term Withdrawn the Student from the CCA Career. Once the Student is Term Withdrawn, the Automatic Tuition Calculation process must be run before proceeding in updating the Student Program/Plan. Refer to Tuition Calculation for Individual Student. 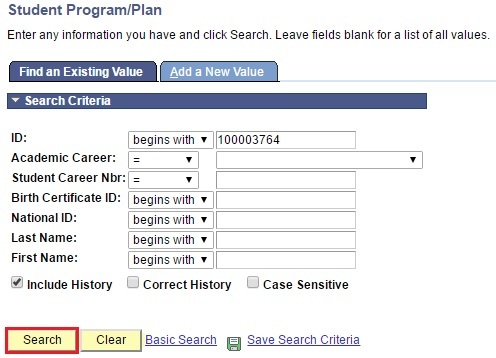 Navigate to Main Menu > Records and Enrollment > Career and Program Information > Student Program/Plan. 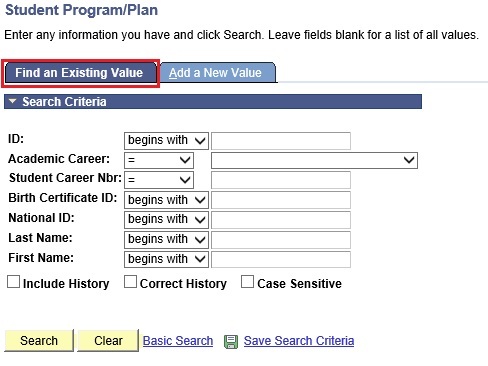 To find the existing Student Program/Plan, click on the Find an Existing Value tab. 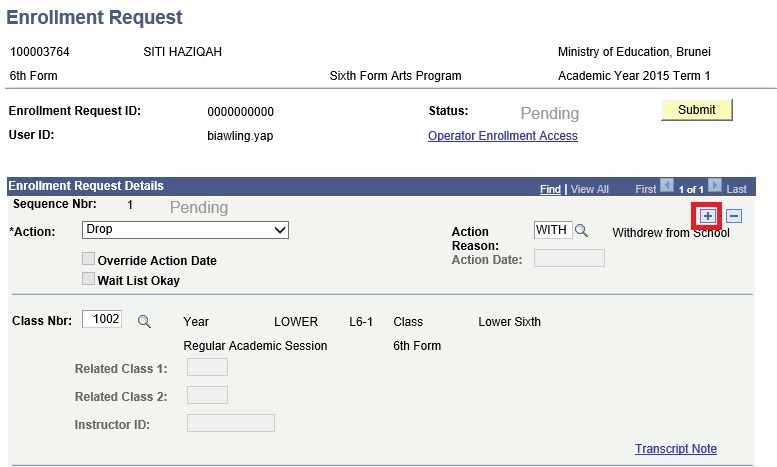 Enter the Student ID of the student who is withdrawing from school in the ID field. 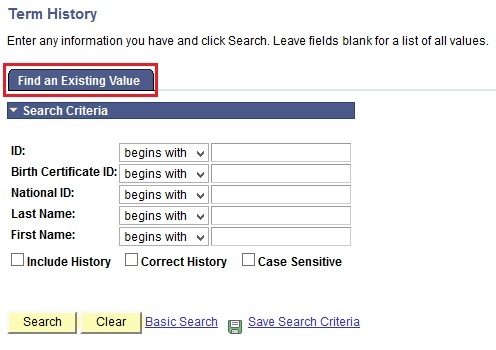 Select ‘Include History’ checkbox when searching. 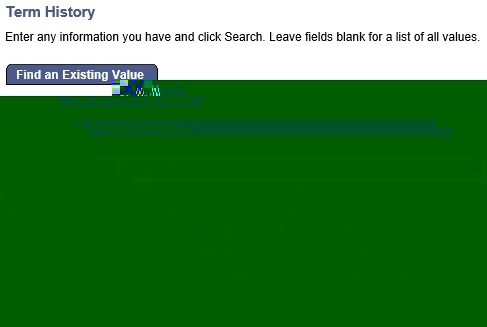 User will be directed to the Student Program/Plan page. 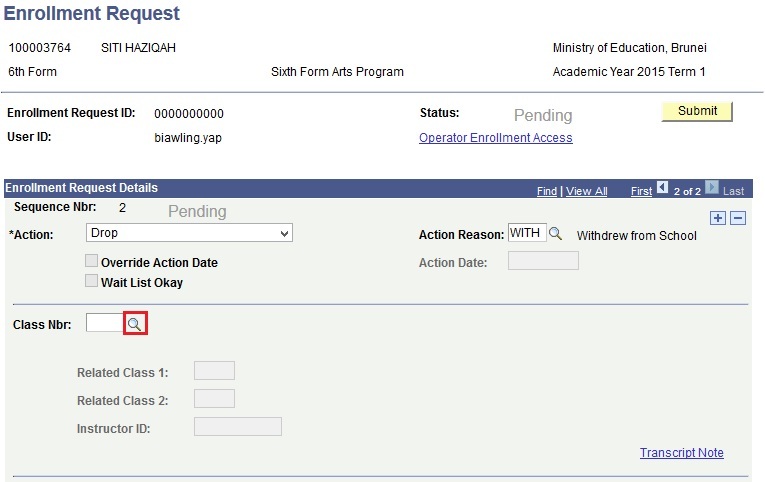 On the Student Program tab, click on the ‘+’ icon to enter the withdrawal record. 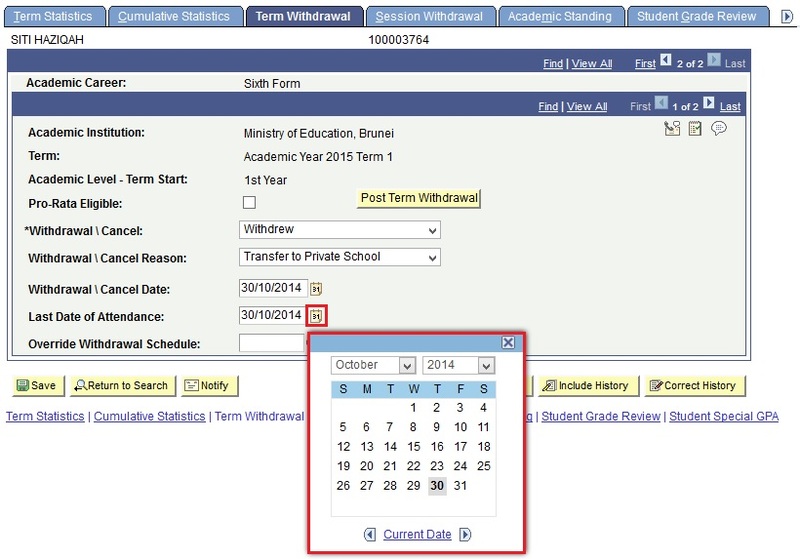 Click on the Calendar icon to select the date from which the student will withdraw from school as the Effective Date. Click on the Program Action lookup icon and select ‘WADM’ – Withdrawal. 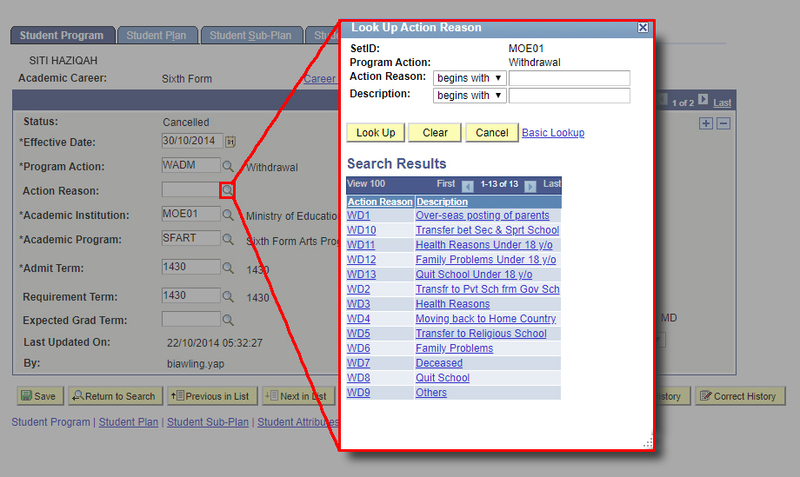 Click on the Action Reason lookup icon and select the reason mentioned in the Withdrawal Request Form. Click on the Save button to save the withdrawal record. 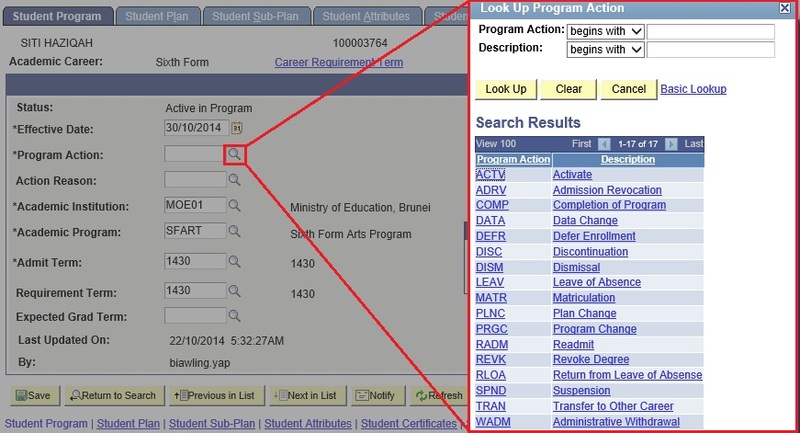 After saving the first record, the user should make the same changes for the CCA Record of the Student.